The Pens took on the New York Islanders Wednesday night at the Mellon Arena in a snow covered downtown Pittsburgh. With just 3 games left before the Olympic break, the Pens look to take 6 points at the Igloo. Before the drop of the puck, Danny Potash blesses us with a Geno interview…good juju? The first 10 minutes of the game were all Marc Andre Fleury with the exception of a Matt Martin and Tyler Kennedy fight, great effort on TK’s part who took on a guy whom was considerably taller them him.. 2 great saves from the Flower within minutes of each other. One on Bergenheim who was coming across the crease and the other on Joensuu who was literally crashing the net after Nielsen tried to bank a shot off of Flower. Mike Rupp tries to go with Sutton, Sutton couldn't remember if his life insurance was paid up so he decided not to go. Letang thought it would be cool to pretend like Fleury and makes a sure goal diving save. John Tavares takes a whack at Letang who was on top of the puck on the ice. Tanger didn’t take much liking to that and goes after Johnny. Both were sent to the box, Tanger for game delay, Tavares for slashing at 10:34. I wonder if Brooks thought the 4-on-4 meant we need more from 44, because he went on a scoring chance palooza. Free Candy takes the center ice drive and gets an awesome chance on net before ringing a coupe off the posts. Not only was he shooting the puck, he was skating beautifully. Best shift for Free Candy in a while. To end the period, Geno puts on a single handed show for the fans with some unreal stick and puck handling before getting a shot off on his knees. The Islanders took the shot department 12-9. Pens headed into the second dead locked with the Islanders 0-0. TK sets the tempo the Pens wanted with a hard check to an Islander. Rupper follows with the truck stick to Meyer sending him to the ice. Letang gets a decent scoring change after making a beautiful play on the blueline to keep the puck in. Free Candy is sent to the box for high sticking off a follow through at 7:11, at 8:23 Staalzy is sent to the box for cross checking. The Pens PK Unit faced with a 5-on-3 did a great job killing it off. Islanders still on a 5-on-4 get caught in a change, Geno picks up the mail and takes Kuni along. Staalzy joins the rush after his penalty expires and Kunitz cashes in on a flub pass from Geno. [0-1] at 10:33. Free Candy with the second assist. Fleury adds to the buzz in the Igloo with a sick glove save on Okposo. Freddy Meyer takes it upon himself and throws a cheap shot at Geno. Meyer gets in return a pissed off Russian who retaliates. A big scruff goes on and the Pens end up on a PP. Dad gets a good chance on Roloson who makes a great post to post save. 0-1 on PP. Rupper and Roloson go at each other, yes I said Roloson, in return we get some more 4-on-4 hockey and before I could even write down the penalties, I hear the goal horn go off. Just 4 seconds into the 4-on-4, Geno deflects a Gonchar slapper past Roloson. [0-2]. Time of the goal 17:00, Robot with the other helper. Flower ends the period with another solid pad save on Tavares from close range. Pens and Islanders tied with 12 shots a piece. The Isles lead 24-21 through 2 periods. The Pens keep the physical game play up in the third with a huge hit from Craig Adams. The Islanders looked to tie the game, but get caught behind the play allowing Billy G and Kuni off to the races. Dad sets up Kuni will a cute little pass as Kuni rips one pass Roloson 5 hole. [1-3], time of the goal 14:48, Dad the lone assist and that was all she wrote folks. Defense really stepped it up tonight; besides a slow Gonchar start who got into his grove, the defense looked impressive. The first game in a long while. 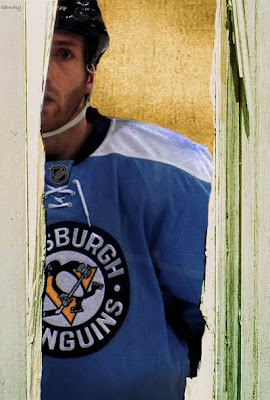 Brooks Orpik was on fire the entire game, a man possessed. Brick wall, oh wait, I mean Fleury was absolutely solid for the Pens as he has been for the past couple games. Flower is definitely in Olympic form. Geno, Gino? Ohh it’s the same. The sleeping giant is almost awake. Geno has been quietly racking up the points. 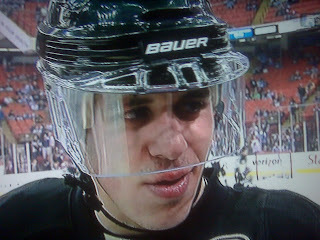 11 game point streak for Mr. Malkin. Seasme Street Line was reunited tonight, they always put in there hard working shifts. Pascal Dupuis was a back checking demon in the words of Steigy.